3. Lawnscaping Challenge #30 - Inspired by another crafter. I have recently added to my collection of Lawn Fawn stamps and papers, and these challenges gave me a chance to play with some new items. I love the green pattern in Lawn Fawn's Bright Side collection, so it is my bit of green. My image and sentiment come from Lawn Fawn's Critters Ever After stamp set. Most of my crafting inspiration comes from blogs, and I love that I can organize inspiring pictures and links on Pinterest. I have boards dedicated to cards, scrapbooking, and color. 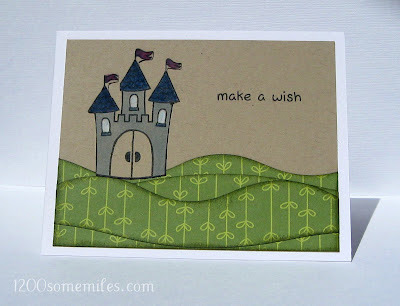 My inspiration card is by Cindy Elam, and I love how she used green patterned paper to make the hills. I found her card on Pinterest, but it can also be found on her blog. I colored the castle a few times before getting it just right. I do not have a gray Copic marker, but the blue looks more gray on the kraft card stock. I mixed colored pencils and Copics for my coloring since I have a limited collection of each. You can mix them as long as you don't color Copics over the colored pencils. You can color your Copics first and then layer colored pencils over them. This is really cute! Love your pattern paper hills :) Thanks for playing with us at CAS-ual Fridays! I love the scene that you created here! So glad that you play with us at CAS-ual Fridays! So cute! 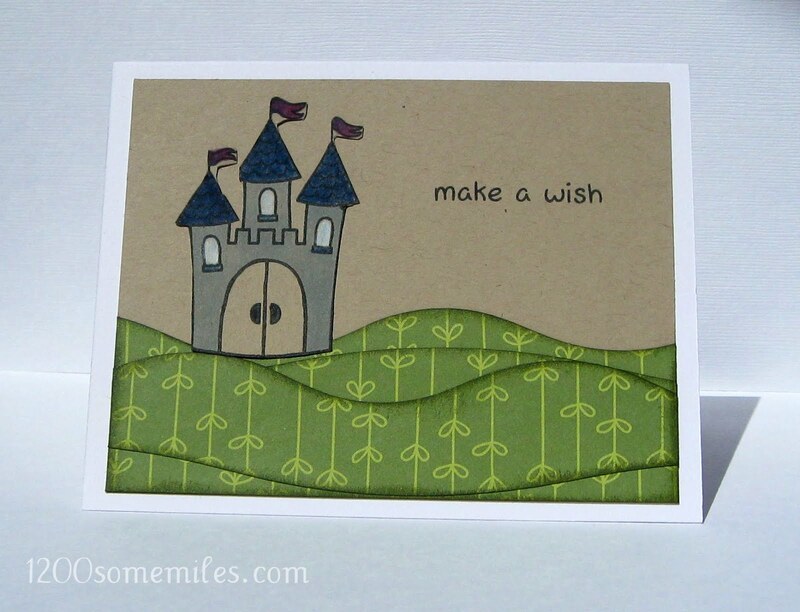 Love the rolling hills and castle at the top! 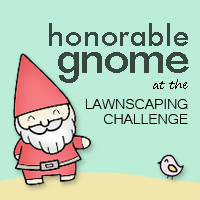 Thank you so much for playing along with us at Lawnscaping for our Inspiration Challenge again!!! This card is darling! Thanks so much for playing with us at Lawnscaping! What a great card. I love your paper hills and the way you distressed the the patter paper. Really great work!